THE rain lashing down from grey skies outside the window seemed fitting. Fifth floor, National Union of Journalists HQ in London. Saturday January 16 2010. 10:08am. Time to start the New Ways To Make Journalism Pay conference. Is there a way forward after the perfect storm of the recession and a move to web content no-one wants to pay for? Or mostly no-one, aside from niche business customers. Unless Rupert Murdoch proves us all wrong. Thousands of journalists have lost their jobs and others live in fear of further redundancies. Those, like me, who have left newspaper jobs and joined the massed ranks of freelances are at the beginning of a new and, hopefully, exciting journey. Only trouble is, the Sat Nav is broken, all the hard copy maps are out of date and no-one has any petrol money. There will be other more incisive reports on yesterday’s event. But I thought those who weren’t able to attend might be interested in my own selected personal highlights, 24 hours on. This is by no means a comprehensive report. I attended the conference as a member of the audience, not as a reporter. But found myself in the front row clutching a notebook plus other media equipment…and old habits die hard. So I hope my selective notes give a flavour of at least some of the day. Apologies for the length – but I know a few will want to read it all. Others far more professional looking than me recorded the event via both video and audio. If you have thoughts, concerns or rage about what anyone had to say, please scroll down to the bottom and leave a comment. But bear in mind that they all gave their time for free. Conference chair Alex Klaushofer outlined some of the aims of the conference. Including – what can we still do to fund journalism, earn a living and produce a quality product? 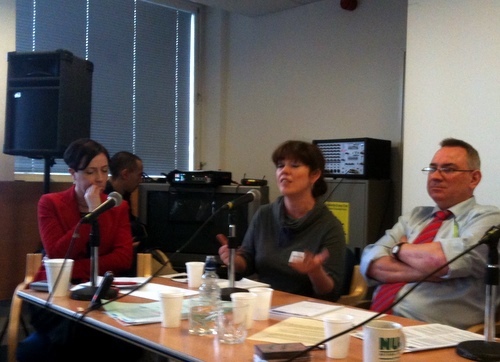 NUJ Freelance Organiser John Toner made clear that this was “a conference that’s been built from the ground up” by the London Freelance Branch – not by union officials. 1. How Can Journalism Be Saved? Writer and media commentator Granville Williams pointed out that people were beginning to invest in US newspaper stocks. Suggesting the newspaper business is rebounding, he said. Granville went on to maintain that the media industry here is, in fact, in quite a healthy position – having cut overheads / costs. The internet and recession had only accelerated what was happening anyway in terms of the steady decline in regional newspaper businesses. Potential online solutions? A paywall? Revenue from web advertising? Don’t hold your breath. “The best the Huffington Post does is break even,” he explained. With many US sites having to appeal for donations. He then turned to the issue of sources of public subsidy in the UK – we have to look for a new model…not old companies re-arranging the deckchairs. Press Gazette editor Dominic Ponsford agreed that in 2010 – or what we’ve had of it so far – people are now investing in big media companies. Dominic outlined the trials of Press Gazette in recent years and how it had survived through changing ownerships and format. Despite the financial difficulties, people viewed it as a “great brand – there is commercial value in that”. The Press Gazette website had to be fast – and free, otherwise competitors will run the same news content and take business away. Subscribers now pay £90 a year for the monthly quality print product. “Blog-style start ups are going to be the future of journalism,” he added. How do you make Press Gazette pay? 3) Attract people to linked events. Sadly, this first session overran and there was no time for questions. David Parkin, editor of TheBusinessDesk.com used to be Business Editor of the Yorkshire Post. He launched his Yorkshire site in November 2007 and followed that up with a North West launch in September 2008.
Business news happens on an hourly basis, he continued. The important thing was how you deliver that news. And how you develop a community to interest advertisers. The new business lost money at the start. David and his backers felt it would take 18 months to break even. “For me, it was very much about contacts.” Contacts he had built up during his time at the Yorkshire Post. Added David: “It was very much an opt-in proposition.” IE You register first but the site was then free to use. A paywall wasn’t a consideration because they didn’t have the cost problems of newspapers. The business couldn’t charge a fortune for advertising at the start but could raise rates later, with sponsorship of various sections, plus all sorts of other things like seminars to bring in revenue. Chris Barry, then Business Editor of the Manchester Evening News, came on board for the North West launch. Events have subsequently borne that out with redundancies at both the Yorkshire Post and MEN, said David. A niche business with 28,000 registered users across both websites. Very much a high income niche audience – attracting quality advertisers like Jaguar, banks, law firms and airlines. The cost of a banner ad on the daily email for two weeks is £2,500. Each reader spends an average of three minutes a day on the website – and David said both he and his advertisers were happy with that. And if a niche audience trust you, then you can sell them other things. He’s looking to further branch out into lifestyle, travel – plus property when the market picks up again. Now employing five journalists and aiming to expand the model “in other parts of the country”. In later questions, David was asked if he might come to a point where he would sell up, given the right offer? He said “his finance people” had told him it was “not a lifestyle business for you – if we get the right offer, we have to consider it”. Did he know the idea was going to work? Contrary to what others had warned him about, David said he actually slept better after the launch – as you are in control (not anyone else) and can fix any problems. Daniel Johnston is the founder of indusdelta.co.uk a niche news, analysis and community website set up in 2007 for the welfare to work industry. It sustains itself through advertising sales. Daniel described the welfare to work sector – helping the long term unemployed back into jobs – as a “microniche”. He made no profit in the first 18 months or so but building up relationships and a reputation gained value. Now makes a small profit with advertising revenue and has taken on another staff member. But Daniel made the point that a one-man band is not necessarily good at everything. It is simple to set up a blog but anything more than that is a different matter, he added. You do need to own your own website – “which is a bit of a bigger deal”. Having said that – it works and it makes money. He sends a weekly email to 3000 people and 8000 different people read his site in each month. Does he worry about a rival trying something similar? In later questions Daniel admitted: “I had a Business Plan but I never fully finished writing it. Blogs are great – but most of us write ‘em for free. Conrad Quilty-Harper is a contributor to themediablog.co.uk who previously worked on engadget.com among other sites and is now studying for an Investigative Journalism MA at City University in London. 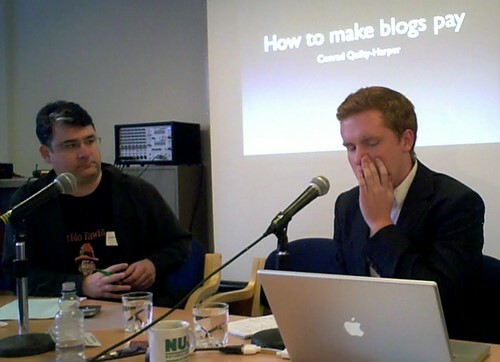 Conrad – @Coneee – was tweeting throughout the event, when he wasn’t speaking, using #nujpay. On reflection, I – @ianwylie – should have joined him on Twitter but wanted to fully concentrate both on the speakers and these notes. He outlined his career history to date, and that of the sites he worked on in America. Engadget.com – “the best” blog covering consumer technology and gadgets – was founded by Peter Rojas and later sold to AOL. Conrad worked on the site from 2005 and wrote some 1,750 posts comprising around 250,000 words. At the start he worked for four dollars a post – “it’s an act of faith” – and the ethos was to do it better and faster than anyone else. As the company became more successful, so did the rate of payment per post. But the site really shone in terms of liveblogging. 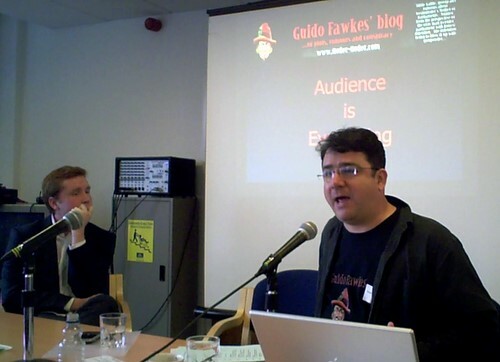 Guido Fawkes (Paul Staines) – @guidofawkes – runs one of Britain’s most visited and influential political blogs order-order.com and is commercially successful as a founder of MessageSpace.co.uk – the advertising network that represents some 40 political websites. By September 2005 the figure had grown to 27,000 and the site now attracts an average of 2m hits a month. More people read the site than read the New Statesman, he said. On MessageSpace, the single highest paid blogger had sales on average of £3,872 per month. The top 10 per cent of bloggers had monthly sales averaging £2,861 in the fourth quarter of 2008 – can add on perhaps 30 per cent to those numbers now. Most of those bloggers have other jobs. Only one or two make a living out of it. And 50 per cent had average monthly sales of just £54. Paul said newspapers still failed to realise “just how close you are to being extinct”. Sites like Popbitch / HolyMoly / Mumsnet / Housepricecrash were all more profitable than newspapers, he maintained. Paul also outlined his alternative revenue stream, including selling stories to newspapers, T-shirts and appearances. If he can get £20,000 from a newspaper for a political scandal story, he’s not going to give it away for free on the web. Fellow political blogger Iain Dale makes six figures out of his media work, said Paul. How does Paul do it? Just like the best newspaper journalists in the Parliamentary Lobby, the harder you work, the more successful you become. He’s up at 6.30am and still working as Newsnight goes out. His information comes from lower down the chain – including interns. They found it easy to get hold of him via the contact details on the site. By way of contrast, Paul asked how would the same people get hold of Private Eye’s Ian Hislop? Paul – no fan of the NUJ – claimed he had actually achieved “the Marxist ideal” – “I don’t just sell the products of my labour, I own the means of production and distribution. Unlike newspaper columnists with a day to write a few hundred words, he didn’t have time to “write perfect prose”. Eric Gordon is founding editor of Camden New Journal, one of the first independent local London papers, which has survived since 1982. He outlined the history of the business and how it was set up. The business survives today on a small net profit which a larger owner / company would not tolerate – no doubt, closing it down, he said. Angie Sammons is editor of liverpoolconfidential.com having worked at the Sunday Express Magazine, Liverpool Daily Post and North West Enquirer. Angie explained how she came into web journalism some three years ago after being made redundant at the North West Enquirer. She came across manchesterconfidential.com got in touch with its boss Mark Garner and ended up setting up a sister Liverpool site – a magazine that’s only available online. There was no advertising or emailing, publicity was all viral. The site now sends out an email twice a week and is “very much offers led”. In terms of advertising, they sell people packages, including creating micro sites for them within the main site. Angie said “the surprise” came last November when Mark said he was going to start making Manchester readers pay. At least it will have by Monday when the paywall site will be live. Angie said unique IP addresses were 122,000 in Manchester with the email going out to 70,000 subscribers – 268,000 readers a month. In Liverpool there were 22,247 uniques last month and 48,000 readers. Income from the paywall will be ploughed back into the business. She also spoke about the demise of regional and provincial newspapers. Adding that local media wouldn’t be in the mess it was now if it hadn’t got rid of experienced staff – over 40s, leaving cheaper, younger, inexperienced people with no mentors. Ian Reeves is a former editor of Press Gazette and Director of Learning at the University of Kent Department of Journalism. Ian spoke about community funded journalism. He used illustrations, including the GothamGazette in New York, which runs appeals – for example, to fund a journalist to cover a specific area. MinnPost.com – free to all content but with a membership approach. Recently The Miami Herald had introduced a “donate” button on its site. Some readers see that as begging – and what message does it give about your brand as an existing media organisation? Can individual journalists use a similar model online to pay their way? Ian used the example of AP reporter Chris Allbritton. Chris asked readers of his blog for money to enable him to stay in Iraq and continue reporting. But some of those who had tried this approach later said they felt too much pressure from readers who believed they “owned” them – getting abuse for daring to go on holiday, for example. Even so, Ian said it was an area worthy of further investigation. Gavin McFadyean is director for the Centre for Investigative Journalism and one of the founders of the newly formed Bureau of Investigative Journalism. Both foundation funded and based at City University in London. He was a long serving producer/director on ITV’s World In Action and has produced investigative current affairs television for the main channels in both the UK and US. The foundation supported models Gavin ran through were, again, largely American, including ProPublica in New York. There are US tax breaks on giving money to fund journalism – and there is a lot of cash out there. But there are foundations in the UK as well. a) Starting Local: What is local? Where do you draw a boundary? / Covering councils and courts require extra staff / Big media groups will try and stamp on you. b) Making The Web Pay: How do you make a site pay? / The NUJ should add a commercial element to their training programme and also offer courses in entrepreneurship / One man bands not good at everything. Can we set up a network as well as the freelance directory where people can find each other – journalist and advertising professional, for example, in the same way as reporters might look for photographers? c) Finance: This group had concentrated on the idea of mobilising communities, moving into spaces that mainstream media is leaving behind / Involvement of co-operatives, including co-ops of journalists / Perhaps a good opportunity to bring people together for a day in a workshop, conference, including organisations with direct experience of co-op groups working together. NUJ President Pete Murray closed with a short speech on defending quality journalism. Adding that it was “very easy to be daunted by the state of the industry”. New Ways To Make Journalism Pay? But stepping out into the street around 4:30pm, at least that rain had stopped. Posted in News and tagged Guido Fawkes, Journalism, NUJ, Press Gazette. Bookmark the permalink. Thanks for this post. It sounds like everyone is thinking about a lot of the same questions, great to know a little about what others are doing. I am co-editor of a weekly newspaper in northern Vermont http://www.bartonchronicle.com which has lost some advertising but not readers. So far we still have our veteran staff. Yay. You won’t find the week’s news on the web site- we are using the free site to promote the paper by running selective pieces from the archives.